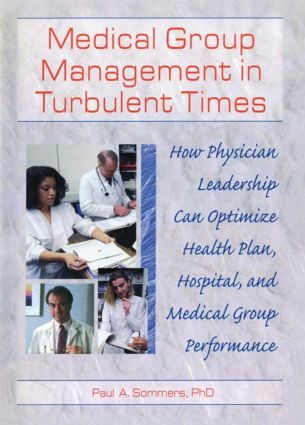 Medical Group Management in Turbulent Times: How Physician Leadership Can Optimize Health Plan, Hospital, and Medical Group Performance provides you with proven methods and new strategies on how to deliver more effective health care, health products, and related services to patients and other consumers. Stressing physician leadership and proactive participation, this text will enhance your understanding of how a working relationship between practicing physicians and health care managers is a positive and necessary means for administering and managing quality health care now and in the future. In addition, most units in this text feature a “factors to consider” category that advises you, for example, how to research competition, establish a target market, and research the demographics of a community before formulating a plan to increase your number of patients. Complete with recommendations, sample plans on how to market health services or better serve your patients, and suggestions on how to enhance quality care, Medical Group Management will give you the knowledge to successfully address problems and work together with other professionals in the health care community to provide quality services to patients and consumers now and into the next century.